Our church gathers together every Sunday morning at 10:30 AM near the back of our property. Streetlite is located at 1121 Riverside Avenue in the heart of the Federal Hill area. You can use the map below to find your way around. 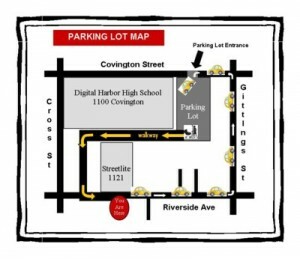 We encourage all our guest and regular attenders to park at the Digital Harbor High School parking lot (our church is authorized by the school to park there for our church services). The lot is located at 1100 Covington Street (21230).Follow the signs to the pathway from the lot to our church.